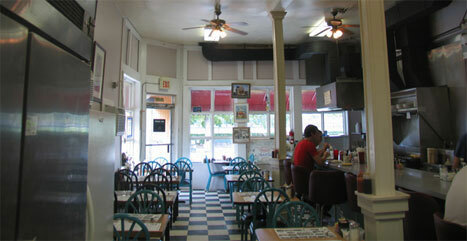 Charlie’s Café—comfort food, good-humored service in the best tradition of American breakfast places. “Nope. The name’s Ted,” Ted smiles. “Charlie’s not here anymore”. It is a sparkling clear Sunday morning, the sky so blue it could freeze in place. No matter cold or hot, rain or shine, spring or fall, Sunday morning at Charlie’s Cafe in Norfolk, Virginia is a ritual, perhaps even a religion. The vittles are the definition of comfort food. The service is top deck, and the hands are a mixed bag of interesting characters all wearing the black “T’s” with the inscription, “Charlie’s Café,” broadside across the back. It doesn’t seem to matter what time you turn up on Sunday morning or on other days, either, the scene is always the same: short line waiting while couples at tables and the counter eat breakfast and read the paper, groups of four converse at tables in happy tones, an occasional group is boisterous: a lady at the corner table has a deep guttural laugh that overrides every sound in the place. The efficient cook staff is busy on the other side of the counter, spatulas banging, pots twirling, fry pans dancing, toasters popping, pancakes flipping. They are all business preparing comfort food and “Killer” omelets ($19.99) for those willing to meet the challenge: a dozen eggs topped with habanero salsa and a stack of 8 Charlie’s Pancakes. Eat it all in an hour, don’t leave the table, “keep it all down,” then it’s on Charlie’s and you get a free Charlie’s T-shirt too! Young couples at wedged together tables sit across from each other with mooning eyes; the couple at the long counter, sitting on burgundy stools that turn like at an old drug store counter, chat intently, he shoveling food and she daintily choosing while her elbow rests on her Daytimer on top of her Bible with a certain place marked by a red, silk, narrow ribbon outlined in gold. A huge lady, bursting at the seams, struggles at a table to keep from falling off her chair while she scrapes the last of her breakfast into a white foam tray to take home. Her friends laugh uproariously at her antics but she is a lady who knows what she likes and to hell with being skinny. There is a guy in a flannel shirt seated on a counter stool, his glasses resting a way down his nose. Intently, he reads his book in one hand and forks at an enormous, puffy omelet with the other, sloshing his coffee mug held firmly with two middle fingers in between forkfuls hardly even looking at the plate. An older couple dressed up for church speak happily to Ted as he counts out their change. She is thin with gray hair and wears her pearls with distinction while he, intent on Ted and the check, adjusts his camel overcoat collar encouraging Ted with a big, head-nodding smile. On the high yellow walls are a collection of local art mixed with portraits of Charlie’s Cafe, a series of posters of Marilyn Monroe in net stockings and images of her on stage during filming of her films, and some neat handcrafted artworks like a decorated Ukulele covered with flowers. At the far end of the room a waitress makes the corner from the kitchen with a covey of hot plates balanced on hands and arms. Her hair, the color of a lion mane, has a classic Guinevere twist knot style falling half way down her back. She is an attractive gal with a pleasant way about her. My bet is she earns big tips. Another waitress has “girl-next-door” good looks with a ponytail and jeans and a Marie Osmond smile. Always paying attention to details like making sure we have sugar free syrup for my pancakes and my poached eggs are done perfectly. Meanwhile the guy in the printer’s hat buses the tables and fills in pouring coffee refills. He has a shaggy beard and a very long, thin red face, like a Gustov Doré Don Quixote illustration come to life. And, nearly always, a tall, gentle, mountain of a man seems to be everywhere at once, serving food, taking orders, attending the cash register, his manner one of true sincerity. The butter comes in little, gold, teaspoon size tubs. Thrown on top of your meal and may or may not be all melted depending on how long they have sat on the hot pancakes. At Charlie’s you butter your own toast. Water and drinks are served in mason jars. A new twist is “Charlie’s orange juice Mimosas” served in a mason jar with a foot like a wine glass. Made with 100% locally made orange juice, the latest rage in Ghent* I hear. Whatever suits your fancy, breakfast or lunch—it’s there seven days a week from 7 am to 2 pm and on Friday and Saturday nights, 6 pm until 3 am. I promise you won’t be disappointed. Built around 1905 Charlie’s building was the residence of one of Norfolk’s finest…. a firefighter. James Harper and his wife Berta bought the lot at 18th and Granby Sts and constructed the single family Victorian home. Later it was converted to a confectionery, a hot dog bar (“Swanky Franky’s”) and later Charlie and his mother opened “Charlie’s Home Cooking.” Kathy Lawless bought it from them and introduced the famous “killer omelets” to the scene that are still served today. Now it is Ted who oversees the tradition. He is tall and thin, prematurely gray, bobbing about making certain everyone has the best he can serve to a very thankful community. 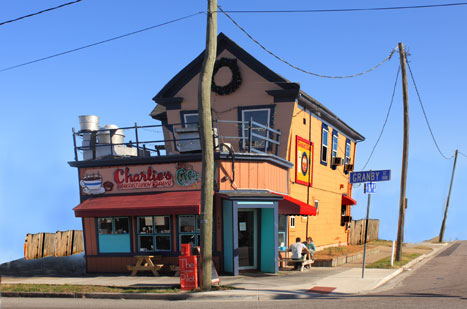 *Ghent is a popular area of Norfolk, VA where Charlie’s is located. Well you can never go wrong with a “good food” article, especially one that makes your mouth water! This could be your calling…I’m marking this spot on my to do bucket honey do grocery list and accompanying 3D map. Please keep up the good work sharing: All the food that’s fit to print. Great article-makes me wanna go there.